Mar 2 Blogging Basics 01 | Brand "You"
We live in such an exciting time... the power of the internet has made it so easy to share our various gifts. Our passions, our experiences, the places we've been, the relationships we have are worth sharing with others and, when done for God's glory, can be life-changing. You never know what opportunities might arise when you present your talents to others! But putting it out there can be scary, and you may be thinking, "I have no idea what I'm doing." That is 100% ok! I'd love to share with you the little bit that I know from years of researching blogs and creatives. So today on the blog, I'm starting a six part series on "blogging basics" to help you take your business (and yourself!) to the next level. Like Lara Casey and Emily Ley often state, it's time to "make what matters happen"! The things that are on you heart for God? Get out there and do them. Moving on from there, begin piecing together elements that feel right to you. Colors, fonts, shapes. If you're struggling to get started, create a pinboard to function as your branding mood board. Not only is this really fun, but it makes it easy to see what you're drawn to when you think of your brand. Then pair it down! If you could only pick three images to describe your brand visually, what would they look like? Logos carry a lot of weight with them. They should be visually striking, not too complicated, and be able to work in a variety of environments (header of your page, business cards, on the screen of your phone...) It's tempting to type your name in a cute font and use that as your logo. While that can look good, it needs to have something that makes it unique and recognizable as your brand. This is where collaboration can be so helpful! Reach out to your graphic designer or illustrator friends. Email a calligrapher who's work you like on Etsy - see what they would charge to write your brand's name to function as your logo! They will naturally want you to give them credit on your page, which gives you the wonderful opportunity to share their amazing work, while making your brand look immensely professional with a custom logo. Perhaps there's an object or symbol you want incorporated. My fur-baby, Phoebe, is featured in my logo to reinforce the playful, curious nature that is TPA. I drew her silhouette in Illustrator, which you can watch tutorials to learn how to use the pen tool yourself, or you can reach out to someone else and ask them if they would be interested in doing it for you. Watercolor illustrations are also a gorgeous idea to incorporate - Taylor has some gorgeous florals in her paper goods, and would be a perfect person to ask to recreate some for your brand. The most important part of your design is consistency. Pick three fonts or fewer (more than than that and things start looking a little cray!). Make all of the images in your posts the same width. Stick to a color palette in your page's design. 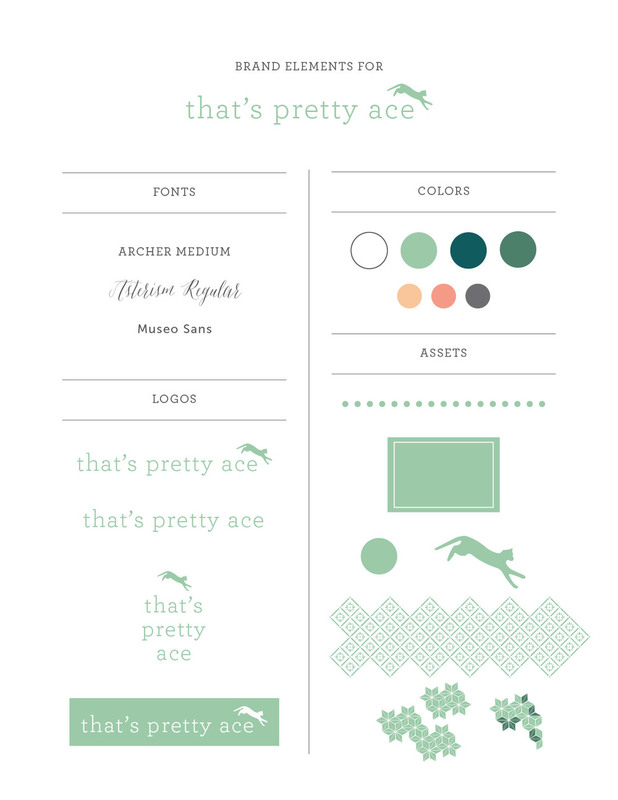 Here's what my branding cheat sheet for TPA looks like... it has my logo in several different, but cohesive, formats, color palette, fonts, and design elements I can use when making imagery. With so many blogs out there, making yours look professional really makes you stand out. It says that you care about the details, and it takes away any visual clutter that might distract from your gifts and your message. Believe in what your calling is and go for it! God created you with special qualities and presenting them in their best format is worth the time and effort.